These Valentine’s Day Treat Bag Toppers work great for giving friends, family, teachers, or anyone else a special little Valentine’s day treat. These Valentine’s Day Treat Bag Toppers all started with this amazing background. While searching for something, it caught my eye and I had to have it. I love all the colors and hearts in the piece. Our kids love to give holiday gifts (for every holiday) to EVERYONE…teachers, nurse, librarian, cooks…EVERYONE! While I love that they think of everyone, coming up with something affordable for everyone is not always a simple task. These cute and colorful topper cards with a few little chocolates or a homemade goodie in a bag will be perfect and inexpensive. 1. 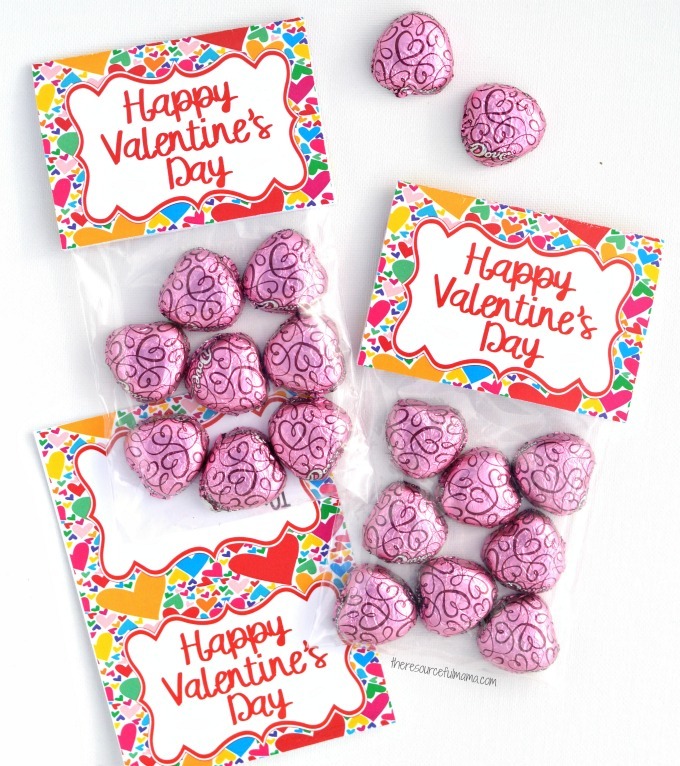 Print the Valentine’s Day Treat Bag Topper cards on white cardstock paper. There are four cards per page. 2. Using scissors or a paper trimmer cut out each Valentine’s Day card. 3. Complete the to and from section of the cards. This will be the back of your treat bag. 4. Fold each one in half, creating a card that shows Happy Valentine’s Day on the front and to/from on the back. 5. Add your filler to each bag and top the bag with a folded Valentine’s Day card. Attach the card with a stapler or tape. We added about 8-9 chocolate hearts to each bag.